IF YOU REALLY want to visit the locals in fabulous Las Vegas, party, drink and gamble — boarding your flight home with not a single penny left — those of us who live here year round would certainly appreciate your contribution to our ailing economy. Putting aside the craps tables, blackjack games and the ubiquitous slot machine — all designed to separate you from your capital as quickly and efficiently as possible — Vegas tourists in 2015 can find other ways to squander their hard-earned money. Sin City is now, by all accounts, not your Mom and Dad’s Las Vegas. Long gone are the $3 buffets and four-drinks-for-a-dollar options that were the signature trappings of this city’s yesteryear. The average tourist who lands here with aspirations of drinking, partying and gambling on a budget is in for a sobering reality: It ain’t cheap anymore. If throwing down at one of the world’s premier nightclubs tickles your fancy, prepare to shell out upward of $15 per drink. Strict adherence to the upscale dress codes could saddle any would-be clubgoer with a hefty clothing bill, especially if you decide to shop at any of the boutiques located in Strip hotels. If it seems that an intoxicatingly good time in the world of $20 margaritas and $700 dress shirts is far out of reach, fear not. If you want to have Ferrari fun on a Fiero budget, you’re not without options. You just need to know where to look. Thankfully, your friends here at Sin City Press have removed the legwork, and put together this handy dandy guide to get you dressed up, drank up and ready to leave your money where it should be left — in the casinos. Casino Royale has a neighborhood feel in a quick-paced environment. Enter Casino Royale. No, I don’t mean “This brings us to Casino Royale,” I mean walk into the place! 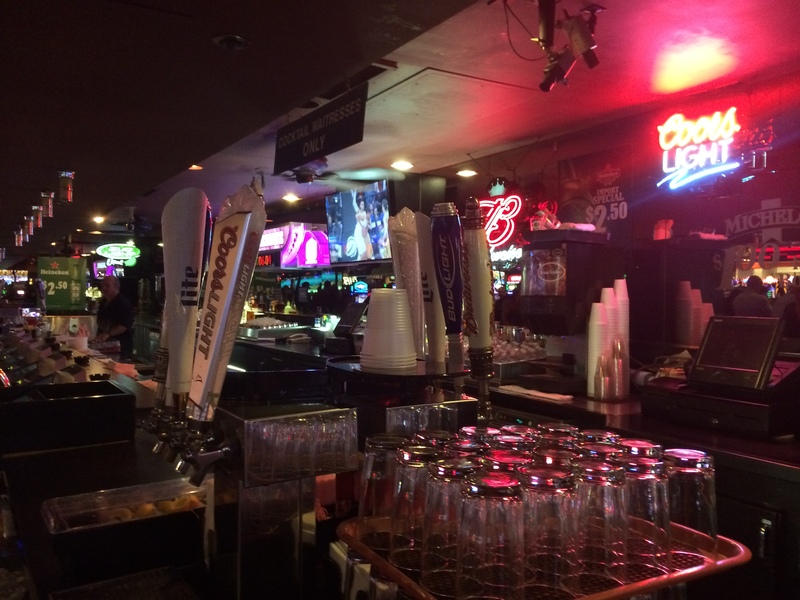 Located just past Harrah’s and directly across from the Mirage on Las Vegas Boulevard, this gem of a watering hole is a not-so-well-kept secret among locals. Serving the “casino” aspect of the Best Western Hotel and Casino, this place is reminiscent of “Old Vegas” in many ways, from the vintage carpeting and eclectic mixture of table and machine gambling to the classic outfits donned by the cocktail servers. 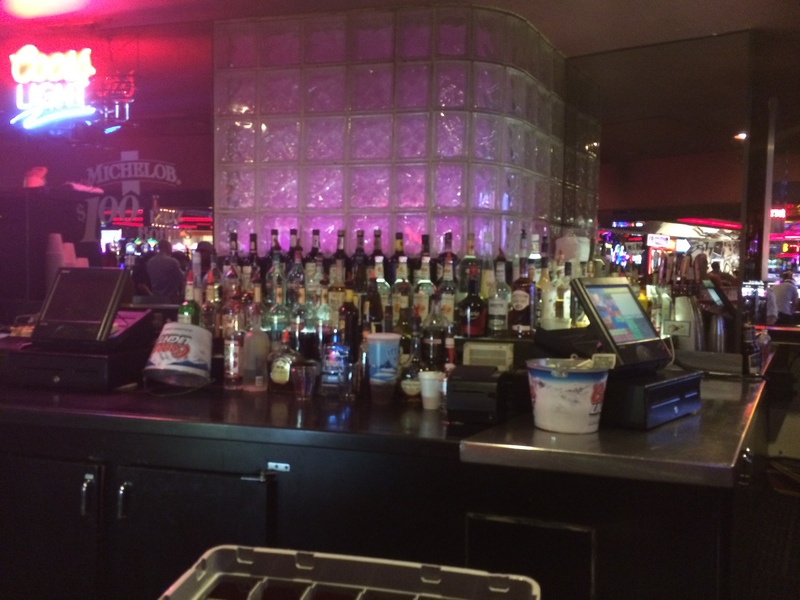 The Casino Royale bar is perhaps most famous (or infamous) for their $1 Michelob bottles. That’s right — 12 fluid ounces of beer for a dollar. That’s fifty cents cheaper than the bottled water and in large part responsible for the sale of more than 120 cases of Michelob per day. (Yup, that’s over a million bottles sold annually for you math majors.) Outside of the sinfully affordable beer, other refreshment fanfare includes mixed drinks in the $2-$4 range, premium liquor at astonishingly reasonable prices and (don’t tell them we said it) free cups of coffee to those early morning, die-hard denizens of the bar who are finally ready to call it a day. Alongside the classic atmosphere and yesteryear prices is perhaps the most endearing quality of the Casino Royale bar experience: the guys behind the bar. Although each is possessed of a unique sense of humor, these guys are no joke. Always courteous and professional, the bar staff handles an exorbitant volume of liquor sales in a manner so efficient and proficient as to make the most seasoned beverage manager marvel. You’ll wonder if you can trust your eyes as Mark opens multiple Michelobs more quickly than you’d think possible, the bottle caps jumping into the air like frogs in a dynamite pond. Crack a joke with either of the two Mikes, and you’ll find a well-sharpened wit, clever sarcasm and a string of the most hilarious jokes you’ve ever heard, locked, loaded and ready to serve along with your well made, well-priced drink. If you’re more in the mood for sustained conversation and humorous anecdotes with your libation, we recommend ordering an “Old Fashioned” and conversing with George, a former professional stand-up comedian with a welcoming smile and a personality as intoxicating as anything he will pour into your glass. Regardless of the time of day, the drink you desire or the server who concocts it for you, the bar at Casino Royale is a can’t-miss bet. Heading out to dinner after drinks? You’re going to need stylish and sensible clothes to fit in at that fancy restaurant. Make no mistake — walking through Strip hotels in cheap sandals and a Hawaiian shirt is no longer viewed as acceptable tourist behavior. If you’re not looking to drop hundreds on a new suit or thousands on a designer dress, fear not. 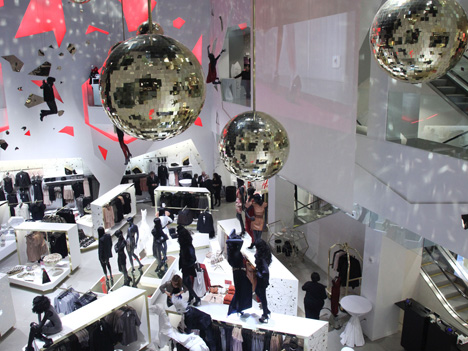 The H&M located in the Caesars Palace Forum Shops has men and women’s clothing that is affordable and trendy. Bringing the kids? No worries, the store is huge and offers plenty of children’s clothing as well. Despite the over-the-top decor and hip music, the store has a large clearance section, and a careful shopper can find a great pair of shoes or handbag for $10. For women looking for an off-Strip place to explore Las Vegas’ more unique offerings, why not visit Patty’s Closet, a feminine boutique with plenty of statement pieces? Find reasonably priced dresses, shoes and accessories at a store that is as bold as some of the costumed characters walking the Strip. A 9-mile drive from Las Vegas Boulevard, it’s an easy trip for tourists looking for a less traveled journey through Las Vegas. Though all of those offerings may scream “ready for a night on the town,” we understand if you’re looking for a more vintage or high-end shopping experience on a low budget. It is Vegas after all. The Attic, a vintage clothing store, is perfect for the hipster in you. Though it has some high-end prices and cool, funky finds, there are some gems you can snag for a low price. The store’s cool atmosphere and one-of-a-kind merchandise selection is perfect for tourists looking for an artsy escape in Sin City. However, if you’re determined to feel like a big spender, try taking a stroll to Goorin Bros., a cheaper-than-it-appears hat shop at the Linq retail and entertainment complex on the Strip. You can grab a fancy pizza or drink nearby, try on some reasonably priced hats in a shop that appears to have been ripped from the streets of early 1900s London and munch on Sprinkles cupcakes after. Goorin Bros does a wonderful job of making each hat appear as a work of finely crafted art — from its $160 Panama-style Odis Lee hat to the $17 (on sale) Anja schoolboy cap. It’s the perfect way to top off a day of drinking, shopping and experiencing Las Vegas’ beer and clothing scenes.